Students studying in anna university have written the exams in the month of November – December. They are waiting for the Results as the paper correction are completed today. As a matter of fact these results can change their life to the whole new level. The more important question on every ones mind is that where to get the result. So the are going to be published in their official page. The links are provided in the link below. More over students the students are afraid as the correction was a bit strict this time. This is due to increase in the quality of the engineering students. The professors working in the affiliated colleges are worried as the students quality is being decreasing year by year. On the course of which the top ranking professors are planning to bring back the quality of the students. How to see the Anna University result ? Where to find the Anna university result nov dec 2017? When Will the Anna University Results will be published? Revaluation Results UG (Batches 2014,2015,2016) of April/May 2017 is Published on 25/8/2017. 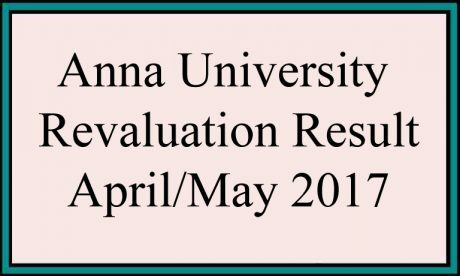 The under graduate revaluation examination results have been released by the Anna University today on its official website. Candidates who have applied for revaluation can check the results from the official website. Copy the below url link and go to the new tab and paste it to verify the revaluation results. Visit the official result page of Anna University by going to the above url. On the homepage, enter your registration number, date to birth and enter the captcha correctly to login to your profile. The results will be displayed on the web screen. After checking your results, take a print out of the result and keep it for future use. This revaluation results are declared for students in their current 2nd, 4th, 6th, and 8th semesters. The result is also available on the alternate result portal such as coe1.annauniv.edu and coe2.annauniv.edu. For any query regarding the results, candidates can visit the official website of Anna university. According to a report published by a journal, since 2017, the Anna university has collected ove Rs 75 crore from engineering students for re-evaluation of papers. In a notice, the varsity said that, “no undergraduate UG and post graduate PG (full time and part time) student of the anna university departments, affiliated colleges will be allowed to appear for their arrear examination. who have already exceeded their maximum duration of the program as per their resolution. Anna university is a technical university in Tamil Nadu, India, named after Thiru C.N.Annadurai, a multi-faceted personality and the former Chief Minister of Tamil Nadu, formed on 4th September 1978 as a unitary university. The new university encompass College of Engineering, Guindy (one of the oldest technical institutes in the world and has a history spanning 220 years, Alagappa College of Technology, Madras Institute of Technology and the School of Architecture and Planning. It became an affiliating university in 2001, monitoring about 250 Engineering colleges in Tamil Nadu. Again in 2010, it has got back the unitary status. In 2011, as per Act No.20 (Tamil Nadu University Laws Amendment and Repeal Act) of Government of Tamil Nadu, it has become again an affiliating type university by merging all Anna Universities of Technology with Anna University, Chennai on 1st August 2012. 0 responses on "Anna University Results"